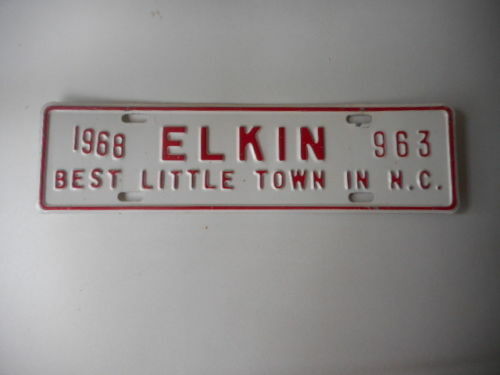 Probably you didn't know it but most of the city license tags that you see on automobiles in North Carolina were made by J.S. Beverly and Company of Oxford, North Carolina. This plant has been in operation since 1931. It started in a small way but the quality of the work they turned out soon brought in a steadily increasing number of orders and neccessitated enlarging the plant and equipment from time to time. It is most modern in every respect and is North Carolina owned and operated. The place is equipped to do anything in the way of metal stamping. During the past several years tags have been made for several towns, not only in this but also to adjoining states. Charlotte, Durham, Salisbury, Wilson, Asheville and numerous others are having their city plates made by Mr. Beverly at his plant in Oxford. The Department of Conservation and Development had their boat tags for 1933-34 also made there. A change has been made in the type of tag being used by the cities. 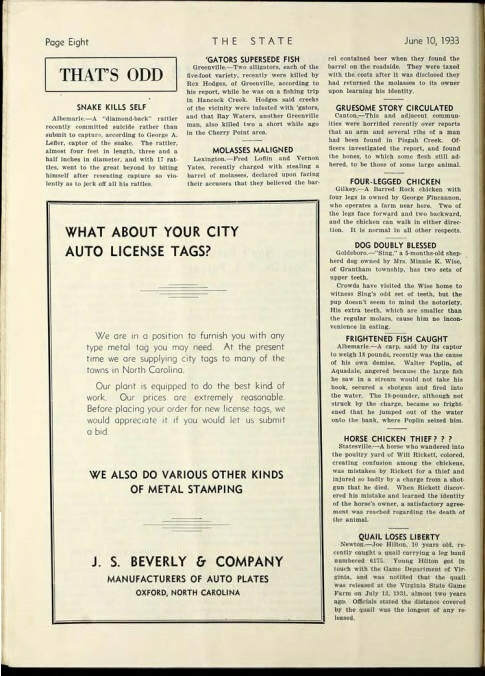 The old tags were rather bulky but the new tags are much narrower, take up less room, and permit a larger ventilation area for radiators of automobiles. The tags being turned out this year are particularly attractive. They are steel dies made and duco painted. All color combinations are possible and the type is easily readable. The tags really are a wonderful advertisement for the municipalities using them. The plates in the pictures cannot be confirmed as to the manufacturer. Only can be confirmed that they were not made by NC Prison Industries.